An Alco "standard rectangle" builders plate from a Bessemer & Lake Erie 2-10-2 steam locomotive built in 1937. Click on the image for a larger version. Photo by permission. 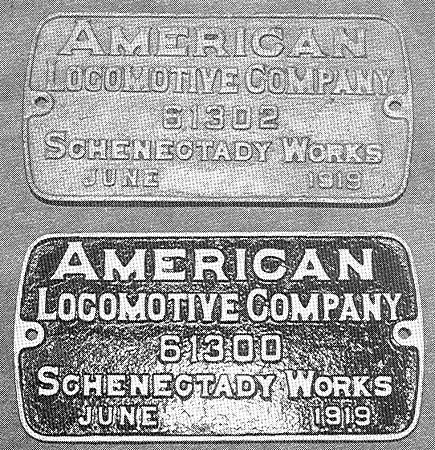 The American Locomotive Company, commonly referred to as "ALCO" was formed in June of 1901 in an effort by eight smaller locomotive manufacturers to compete with the giant Baldwin Locomotive Works. 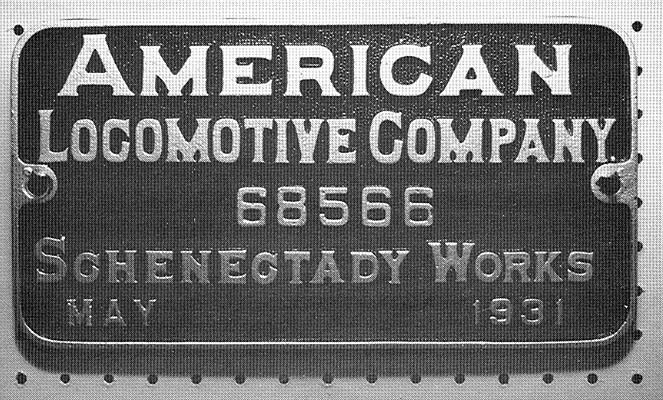 ALCO was the corporate umbrella that initially included the following works: Brooks, Cooke, Dickson, Manchester, Pittsburgh, Rhode Island, Richmond and Schenectady. Montreal Locomotive and Machine Company, LTD. was added in 1904 along with the Rogers Locomotive Works in 1905. This made a grand total of 10 separate locations manufacturing locomotives for the American Locomotive Company. During its first 30 years, ALCO closed the older and less efficient plants with the work shifted to the remaining facilities. The Rhode Island Works was the first to go in 1908, followed soon after by Dickson in 1909. Both Manchester and Rogers were closed in 1913. Pittsburgh closed its doors in 1919; Cooke ended production in 1926; Richmond closed in 1927; and finally the Brooks Locomotive Works was shut down in 1929. This left only the plants in Schenectady and Montreal to continue locomotive production. With this as a brief outline of the company, we will now describe the more typical builders plates produced by ALCO. Readers who wish more information about ALCO might consider John H. White's book, American Locomotive Builders as an initial source. In the beginning and common with any amalgamation, ALCO suffered through a transition period not unlike the 1960's Penn Central Merger. 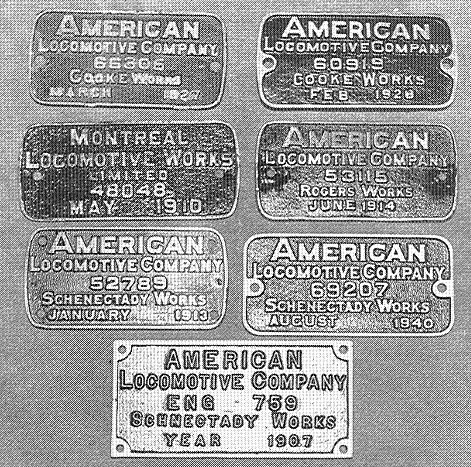 The ALCO transition can be visually seen in the builders plates produced from 1901 through 1903. 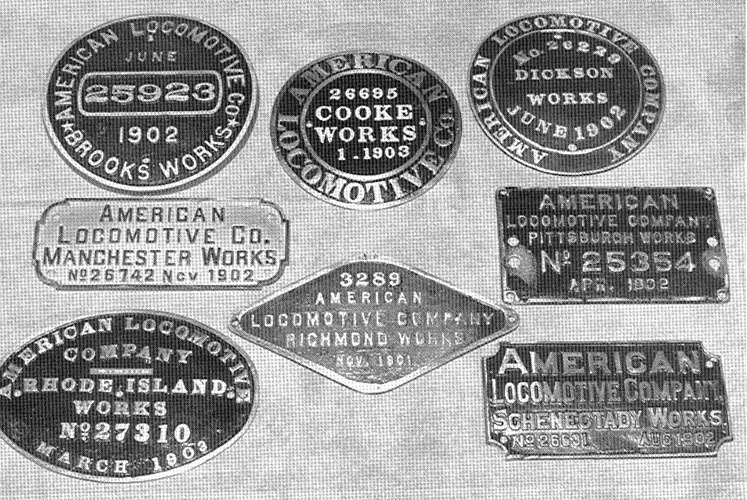 All transitional plates had the name "American Locomotive Company" along with the name of the specific works. But that's where the similarity ended. 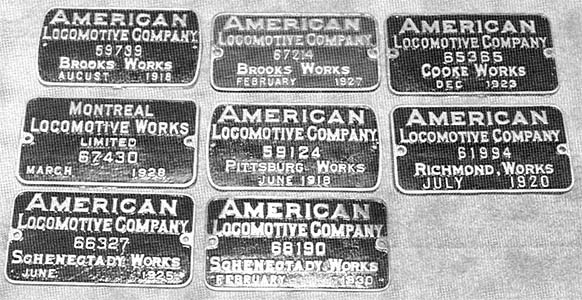 At the outset, most of the works used builders plates patterned after their own pre-ALCO designs. Of course, they were proud of their heritage, This is true for all but the Manchester Works which went from a small oval pre-ALCO plate to a fancy rectangle with dished corners. Perhaps the new design was an effort to look like the big brother Schenectady 's rectangle? We'll never know. To further confuse the issue, two builders -- Brooks and Cooke -- each used two different styles of transitional plates. Cooke initially used a 10 1/4 ” round plate which paralleled its pre-ALCO design. Shortly thereafter it changed to a 12" round plate which was totally redesigned. We have only seen a single style of the Brooks transitional plate (a carryover from the pre-ALCO design), but we understand there was a later style. Hopefully one will surface to prove this assumption. The Dickson Works of Scranton, Pa continued a 12" round plate during the transitional period. Likewise Pittsburgh continued their 8" x 13" brass rectangle, but Rhode Island had to enlarge their transitional plate. Rhode Island's pre-ALCO plate was a 9" x 12" oval. 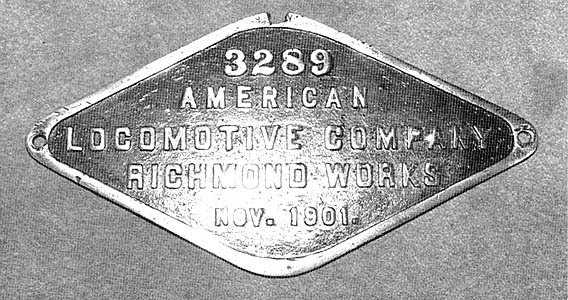 The addition of the American Locomotive Company name required an increase in the size of the plate to 10 3/4" x 15 1/2" while continuing the oval design. Richmond continued the 9" x 17" brass diamond during the transition period. Schenectady also continued their 7" x 14" dished corner rectangle plate. When Montreal and Rogers joined the fold, they did not use a unique transitional plate. By then, ALCO was finally in charge and using a standard design. We do know of at least two locomotives from the Rogers Works that had the pre-ALCO Rogers design, but the construction numbers were from the ALCO series. 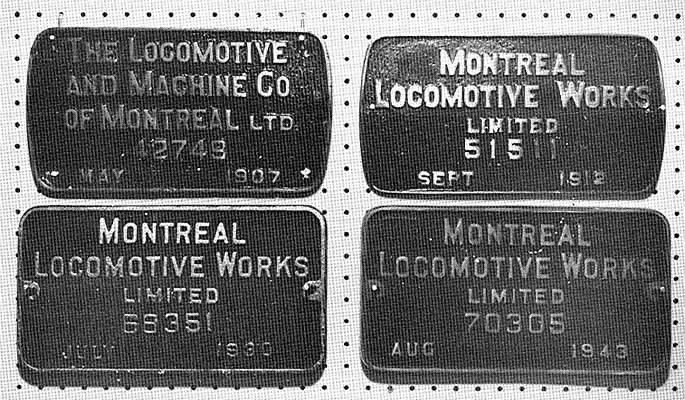 Further, while Montreal used the ALCO construction numbering system, their initial plates had a different corporate name -- The Locomotive and Machine Company of Montreal, Ltd. Soon after, it switched the company name to Montreal Locomotive Works, Ltd. The individual builders continue to use their own construction numbering systems during the first several months following the amalgamation. Once ALCO was more organized, all of the engines built at the individual works were assigned numbers in a master numbering series. As a result you will find early ALCO transitional plates with their pre-ALCO Works numbering system and others of exactly the same design with the ALCO numbers. The transitional plates represent an interesting element for the serious plate collector. Due to the short length of this transition period and the passage of time from 1903 to now, few of these plates exist. Thus the transitional plates are quite a rarity. The ALCO standard rectangle - 7" x 14"
The first "standard" ALCO plates appeared in 1903. They were a 7" x 14" rectangle. This basic plate design was used from 1903 until 1946. The initial 7" x 14" plates had a fine pebbled background and nicely rounded corners. Bolt holes were typically drilled on the right and left side, halfway from the top of the bottom. During World War I, the plates were changed slightly which resulted in a more square looking rectangle, and the pebbled background disappeared. We assume these changes were necessitated by the company switching to cast iron. More about the casting materials later. ALCO also employed a smaller but similarly designed 4" x 9" rectangle. The smaller plate was generally used on smaller locomotives such as industrial saddle tank engines and light switchers. However, some Consolidations, 10-wheelers and even a Mikado or two carried the small plate. As near as we can determine, the small version was used by most if not all the works. "Flying ALCO 10" x 16"
The 7" x 14'" standard rectangular plate was used on steam locomotives until 1946. The mid-1940's marked the end of WW ll and for steam locomotive manufacturers, the transition to diesels. 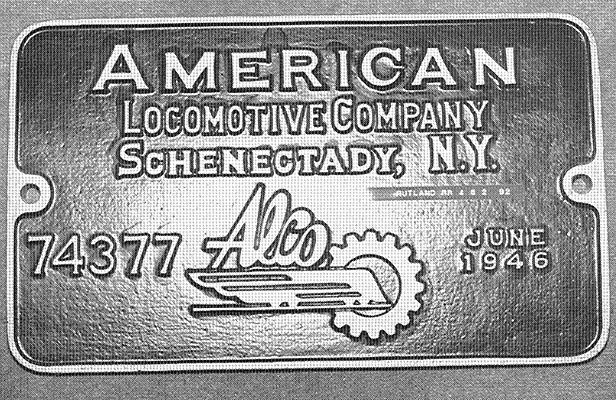 At that time, ALCO developed a corporate logo that incorporated a streamlined locomotive, a gear, and the word ALCO. It appears it was time to redesign their plates using this new logo. For steam power, they decided on a larger plate -- a 10" x 16" cast iron rectangle incorporating all the usual builder's data plus the new logo prominently displayed in the middle of the plate. They used this "Flying ALCO" design for the balance of their steam production. Little did they know that only some 56 domestic steam locomotives would carry this very distinctive plate. This style is very desirable because of the small number of locomotives involved, in addition to the fact that these were some of the biggest and best Iooking engines ever built by ALCO. Steam locomotives carrying the "Flying ALCO" plates included C&O 2-8-4's, D&H and Clinchfield 4-6-6-4's, and the Rutland's beautiful Mountains. Last but not least were the seven Pittsburgh and Lake Erie macho Berkshires which closed domestic steam production at Schenectady forever. 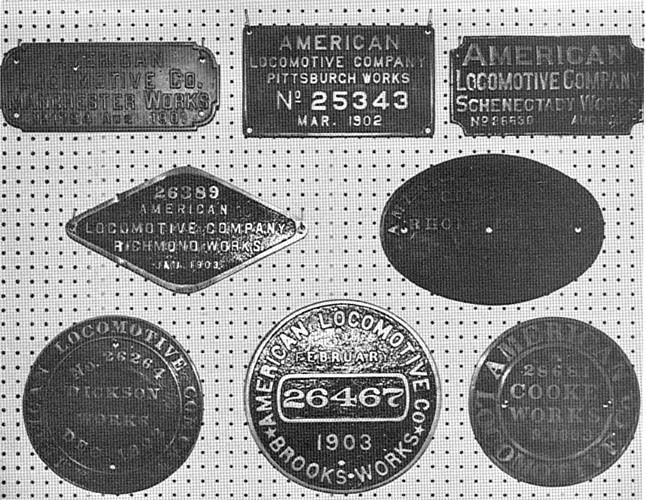 Over the years, ALCO produced non-standard plates both in terms of shape and also extra data. One of the most interesting variations is the ALCO "Double Works" plates. These occurred when the New York Central rebuilt hundreds of Consolidations into Mikados just after 1910. These were new plates, not modifications of the original plate. 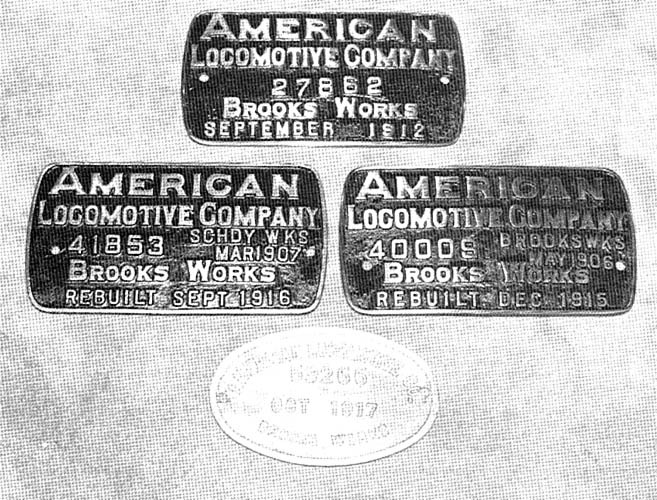 They included the normal American Locomotive Company name, original construction number, in addition to the old and new construction dates, plus some noted the works in which the engines were both built and rebuilt. And all of this information was crammed on a 7" x 14" rectangle. A photo accompanies this article showing a version of these Double Works plates. 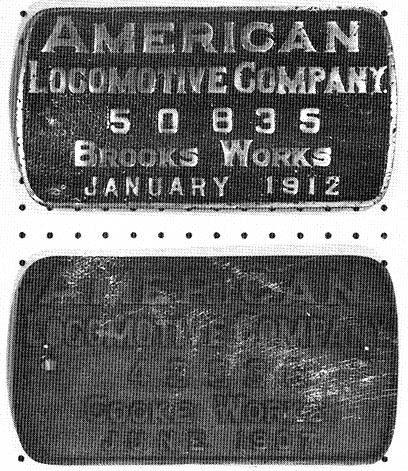 Of the pre-ALCO builders, all but Brooks were using brass in casting builders plates immediately prior to the amalgamation. So it is logical that when the initial standard ALCO plates were cast they used brass. However, by the time the First World War was underway, ALCO switched to cast iron in order to conserve brass. Brass plates would again surface after World War 1. By the late 1920's all the standard plates were changed back to cast iron. That is, almost all, because aluminum examples were used on a New York Central Mohawk order in the mid-20's. This is assumed to be an experiment. Aluminum was not commonly used for builders plates until the diesel era of the 1950's. Other aluminum exceptions to the cast iron standard included the New York Central Niagara's built in the late 40's as well as the Polish 2-10-0 's built about the same time. Which of ALCO Works standard 7" x 14" plates are the hardest to find? The logical vote would have to consider which works constructed the fewest locomotives. So it makes sense that the works that closed first produced the plates that are the hardest to find. This doesn't necessarily make these plates more desirable, as the value for all collectibles is always determined by the buyer. 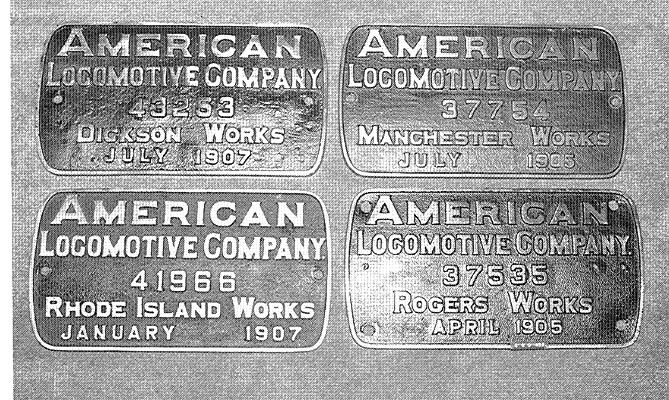 Shown below is a photo which shows four of the more difficult plates to find – ALCO/Dickson, ALCO/Manchester, ALCO/Rhode Island and ALCO/Rogers. We believe the ALCO/Dickson plates are the most difficult to obtain, but that is just a personal preference. We are now starting the next article which will encompass the steam builder plates mounted on Baldwin's locomotives. We would be happy to hear from anyone about plate examples that fall outside the standards described in this article or our article on pre-ALCO plates. While the design and manufacture of plates followed some basic process structures of the manufacturers, there are no doubt many, many variations of the standard theme. These variations were caused by the buyers, sellers and even the availability of quality material and help. We will all benefit from learning about "nonstandard" issues." Email us. Far left. A selection of ALCO transitional plates: ALCO Brooks from Mexican National 4-6-0 #402, ALCO Cooke from I.G.N. 2-8-0 #325, ALCO Dickson from S.L.S.W. 2-8-0 #967, ALCO Manchester from B.A.R. 4-6-0 #60. ALCO Pittsburgh from A.T.&S.F. 2-8-0 #862, ALCO Richmond from Maryland & Pennsylvania 4-4-0 #6, ALCO Rhode Island from C.&S. 2-8-0 #528, and an ALCO Schenectady from Rutland 4-6-0 #57. Middle Left. 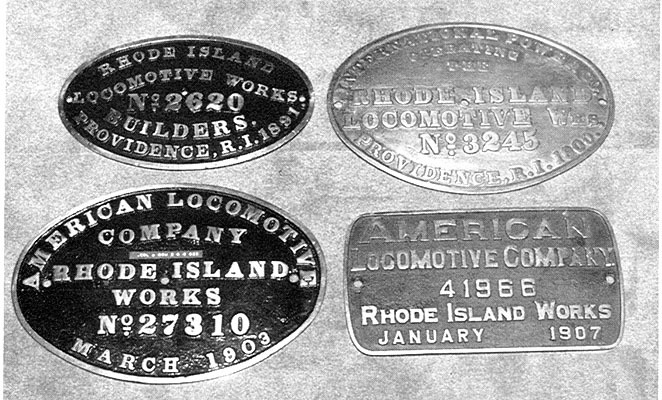 Four different Rhode Island plates showing the transition from Standard Oval, to Large Oval (International Power), to Large Oval (transitional), to 7" x 14" ALCO rectangle. Middle Right. A group of ALCO transitional plates. Only the ALCO Manchester and ALCO Rhode Island have their original pre ALCO construction number series, all the others have the alter ALCO construction number. Far Right. 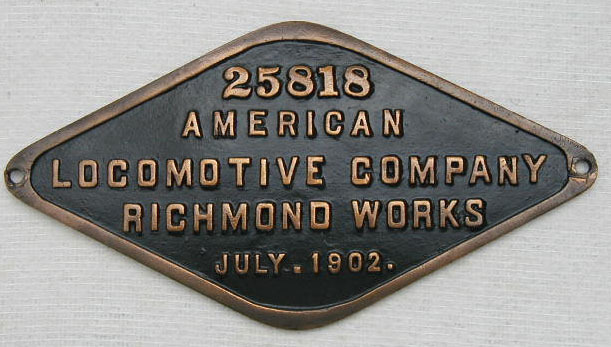 An ALCO /Richmond transitional plate, 9" x 11" and made of brass it is from Maryland and Pennsylvania R.R. 4-6-0 "6". Click here for a color version of a different Richmond plate. Far left. A selection of 7" x 14" cast iron plates. From left to right they are an ALCO Brooks plate from Jersey Central 2-8-2 #859, an ALCO Brooks from NKP 4-6.4 #113, an ALCO Cooke from Norwood & St. Lawrence 2.6.0 #210, an ALCO Montreal from By Products Coke 0-6-0 #2, an ALCO Pittsburgh from D.&T.S.L. 0-8.0 #106, an ALCO Richmond from Virginian 4-6-2 #212, an ALCO Schenectady from Rutland 4.6-2 #80, and an ALCO Schenectady from N.Y.C. 4-6-4 #5312. Middle Left. A selection of the better 7"x 14" ALCO rectangular plates: ALCO Dickson from N.P. 0-6-0 #1093, an ALCO Manchester from Woodstock 4-4-0 #3, an ALCO Rhode Island from Pacific Coast 2-8-0 #15, and an ALCO Rogers from S.S.W. 2-6-0 #403, later to become Reader R.R. #403. Middle Right. 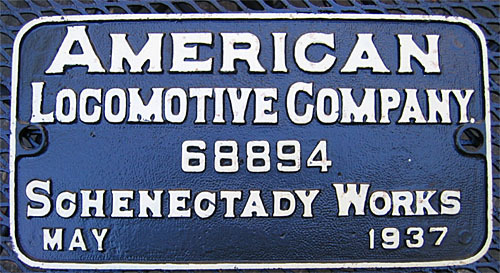 The most common of the ALCO plates is the 7" x 14" brass or cast iron rectangle from the Schenectady works. This is a cast iron plate from N.Y.C. 4-6-4 #5330. Far Right. 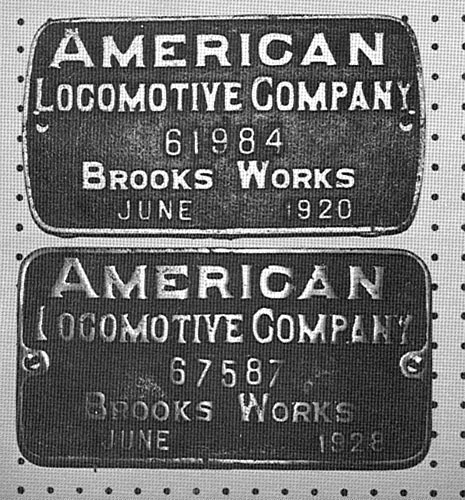 Two versions of ALCO Brooks cast iron rectangles. The 61984 is from Ann Arbor 0-8-0 #50 and has rounded corners; the 67587 is from U.P. 4-12-2 #9021 and has the square corners. Far left. A few ALCO plates had the construction numbers spread apart. The Brooks plate is from I.C. 4-6-2 #2039, the Cooke plate is from Rutland R.R. 0-6-0 #446, later renumbered #101. Middle Left. 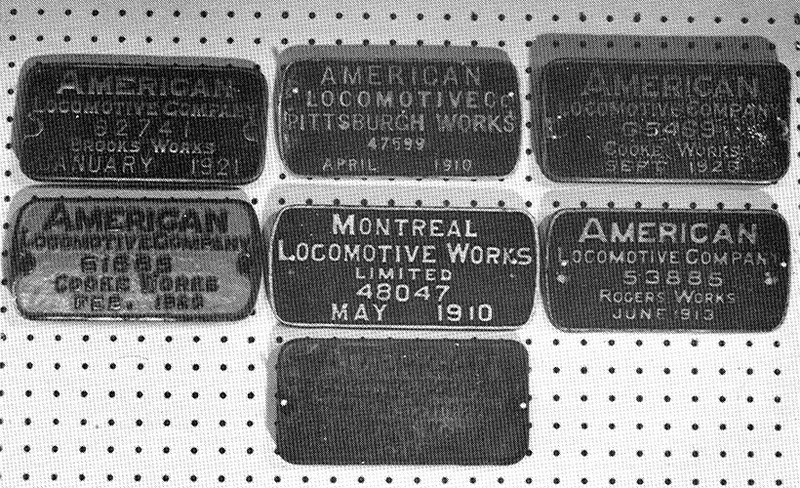 A grouping of 4 1/2"x 9" ALCO plates. Middle Right. A selection of small ALCO plates measuring 4 1/2"x 9" each. They are an ALCO Cooke from Cowham Equipment 0-4-0T #2, an ALCO Cooke from Foundation Co. 0-4-0 #1, an ALCO Montreal from Grand Trunk Pacific 4-6-0, an ALCO Rogers from City of Los Angeles 0-4-0T, an ALCO Schenectady from Grand Truck Pacific 2-8-2 #501, an ALCO Schenectady from a Reading HH660, and an ALCO Schenectady from G.T.P. 2-8-0 #759. Far Right. The "Flying ALCO" plate from Rutland Railroad 4-8-2 #92. It is 10" x 16" and made of cast iron. Wouldn't it be beautiful in brass? Far left. A selection of unusual ALCO Plates including some "Double Works" plates. During the 1910's the New York Central had hundreds of 2-8-0 locomotives sent back to the factory to be rebuilt as 2-8-2 's. Top center shows N.Y.C.& H.R. #2489 built in 1903 and rebuilt in 1912. Next is #41853, N.Y.C.&H.R. 2-8-0 #2866 rebuilt by Schenectady in 1916. #4009 is from International Harbor Belt 2-8-0 #7878 rebuilt by Brooks in 1915. The last plate shown is an ALCO/Brooks special oval from French St. Ry 2-8-0 #281. Middle Left. Both of the plates shown here are from Grand Trunk ( Maine ) locomotives, #61302 is brass while #61300 is iron. Middle Right. 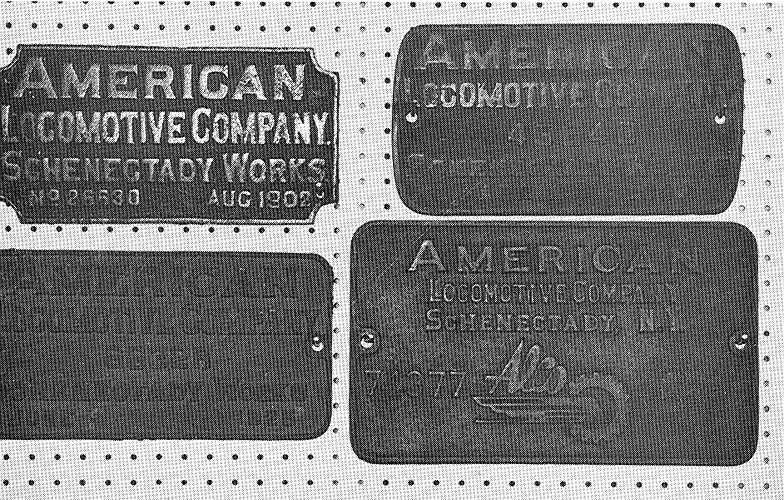 Four different ALCO Schenectady plates, all from Rutland steamers. Far Right. Four different Montreal plates. The 68351 is cast iron and is from a 4-8-2. The later plate, #70305 is brass and is from a 4-8-4. Web Editor's note: This article was originally published in a 1991 issue of Key, Lock & Lantern and has been slightly edited for the web. A special thanks to Ron Muldowney and Tim Moore for their generous permission to reprint it here.